Asians should know what coriander is even if they don’t eat it. The green leafy vegetable that is used for garnishing dishes. It is known by a few names besides coriander: Chinese parsley, “wan sui” or “yuan xu” to the Chinese, dhania to the Indians and cilantro to the Americans and Europeans. Know what I’m talking about now? The seeds, grain or powdered are also used in cooking by the Chinese, Malays, Indians, Americans and some Europeans (the seeds came in my spice rack from North America so I assume that the westerners use them too). I love it in the leafy form. My parents use it to dress up almost every dish and encourage us to eat it as it is rich in iron. All growing girls need more iron so coriander was a necessity for our family of 5 girls! Thankfully, we like it and will obediently chew on the generous garnishing. I carried on with the coriander garnishing to my own cooking and there is coriander in my fridge almost all the time. A quick search on google brought up numerous articles on the health benefits of coriander. I was surprised as I was expecting articles on its uses in cooking mainly. This chart summarises the health benefits. Then comes the question of how much of coriander does one have to consume to reap its benefits? 100 grams of coriander leaves provide the daily percent value of the following: Manganese 21%, Potassium 15%, Copper 11%, Iron 10%, Calcium 7%. 100g is about a bunch that I use over a few days. I should eat more than a bunch a day! Young Living Essential Oils to the rescue! As we know, essential oils are highly-concentrated essences of the plants they are extracted from. One drop of essential oil is equivalent to large amount of the plant, like 1 drop of lemon essential oil is extracted from the rind of 3 lemons, so that we just need a few drops to reap the benefits of a huge amount of the plant. 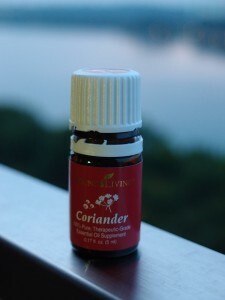 The Young Living Coriander Essential Oil is steam-distilled from the coriander seeds. The essential oil has a sweet, soothing and calming scent, not like the scent of the leaves. It is surprisingly sweet-smelling to me. I was expecting a herbaceous, medicinal fragrance. It is lovely enough to be worn as a perfume! I am also pleased to know that it is in many of my favourite essential oil blends – Awaken, Believe, Clarity, Gentle Baby, Harmony, Joy and Lady Sclareol. It is also found in A.R.T Renewal Serum, AromaGuard Meadow Mist Deodorant, Forgiveness, KidScents Lotion, Magnify Your Purpose, Sensation Massage Oil and Wolfberry Eye Cream (I have listed only those products available in Singapore). So although Coriander is not available from the Young Living Singapore office, you can get the blends with it. 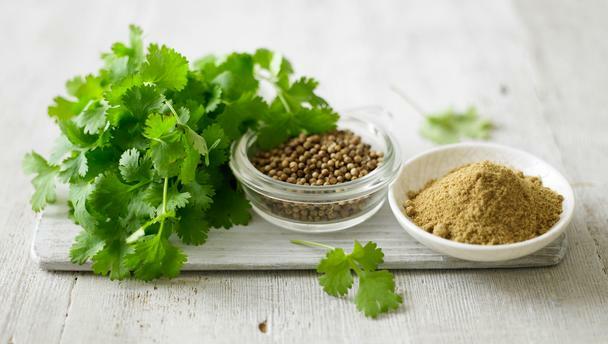 Coriander seeds were found in the ancient Egyptian tomb of Ramses II. This oil has been researched at Cairo University for its effects in lowering glucose and insulin levels and supporting pancreatic function. It has also been studied for its effects in strengthening the pancreas. Coriander has long been revered as a home remedy for relieving feelings of nausea, aiding digestion, and supporting healthy immune function. I will add one drop to my facial spray since it is good for the skin and it smells lovely, and will use it to relieve nausea after a taxi ride or to aid digestion after a heavy meal. 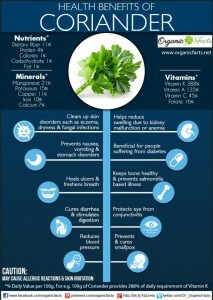 Learning about the health benefits of coriander makes me love the plant even more! I’ll be eating the leaves and inhaling, applying and diffusing the essential oil. If you would like to find out how to get Young Living products, go here. If you would like help to purchase Coriander essential oil from the USA, drop me an email here.